@evleaks has revealed that Motorola is working on a pair of new budgeted smartphone known as Moto C and Moto C Plus and will be available in the new Moto C series. Previously the Moto E series was having the budgeted entry-level smartphones but this time Motorola is going to make a new budgeted smartphone series with more lesser price than the Moto E series. The Moto C and Moto C Plus are expected to launch this month or next month according to @evleaks. The leakster also shared some images from the devices that confirms black, white, gold and red color options for both of the phones The leakster also shared the rumored specifications of both the devices. Let's check them out. 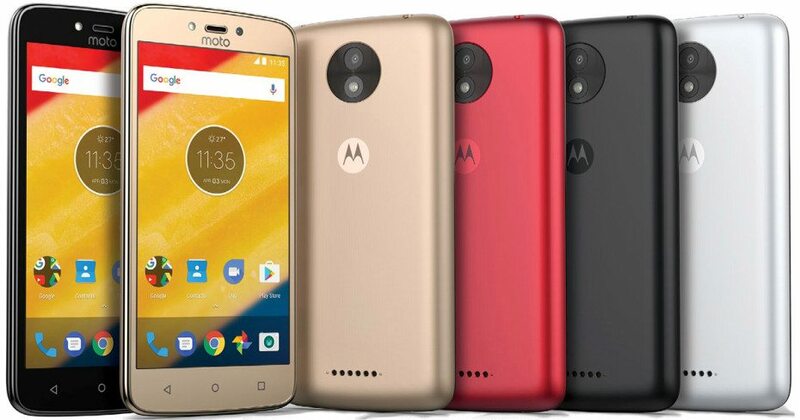 According to Evan Blass, the Moto C is expected to feature a 5-inch FWVGA display having 854 x 480 pixels resolution and will be powered by a 1.3GHz quad-core 32-bit MediaTek processor for the 3G variant while the 4G variant will be powered by the 1.1GHz quad-core 64-bit MediaTek processor. It will have 1GB of RAM and 8GB / 16GB internal storage options with an option of expandable storage with microSD up to 128GB. It will run on the Android 7.0 Nougat OS out of the box and will support dual-SIMs. It will feature a 5-megapixel rear camera with LED flash, fixed focus, auto focus features along with a 2-megapixel front-facing camera. It will be powered by a 2350mAh battery and will have 4G VoLTE, 3G, WiFi 802.11 b/g/n, Bluetooth 4.0, GPS, FM Radio and a 3.5mm audio jack as well. The bigger brother of Moto C called Moto C Plus is expected to launch with a 5-inch HD display with 1280 x 720 pixels resolution and will be powered by a 1.3GHz quad-core 64-bit MediaTek processor. It will come with 2GB of RAM along with 16GB internal storage capacity that will be expandable via microSD card up to 128GB. It will run on the Android 7.0 Nougat OS out of the box and will support dual-SIM as well. It will feature an 8-megapixel auto-focus rear camera with LED Flash and will also have a 2-megapixel front-facing camera with LED flash. A bigger 4000mAh battery will power this device and we will have connectivity options like 4G VoLTE, WiFi 802.11 b/g/n, Bluetooth 4.0, GPS, 3.5mm audio jack and FM Radio support as well. Motorola is expected to launch these new budgeted smartphones soon in Asian markets and in European markets. So stay tuned for more news and updates.